I’d read a few complaints about large groups of cyclists supposedly taking over the road and deliberately slowing down drivers. Recently, a comment on that subject was made on our blog, ‘How Does 'Bike May Use Full Lane' Work?’ I thought this would be a good opportunity to address the subject in more detail. I thought I’d expand on my response to toml, and see what more we can learn about these cycling rogues. Naturally, I’m not going to defend all group rides that have ever taken place. Or all riders. Just as there are good and bad drivers out there, the same holds true for cyclists. So I sought out an example to analyze that should resonate with those who are frustrated, disappointed or angry with group rides they encounter on the road. Here it is. Please watch the entire video in order to follow the analysis below. No cyclist, tractor or other slow-moving vehicle ever forces any driver to pass in a no-passing zone or in an unsafe manner. It’s the driver’s responsibility to pass safely. Next, the reporter and driver point out the ‘Share the Road’ sign. To them, this sign clearly means, “cyclists, please get out of our way.” And that is precisely why this sign has fallen out of favor. It’s become a device of subjective interpretation that can mean different things to different people. However, its replacement, ‘Bike May Use Full Lane,’ states the original share concept more precisely and clearly. Had ‘Bike May Use Full Lane’ been used here instead, the reporter would have had his first clue as to what the riders were doing. Next comes a quote from a local law that prohibits riding 2 abreast on the road. The riders are clearly doing that and could easily have been reported to local police. This would start a dialogue, as the riders would have to explain their actions to the police or a local judge. But in the video, the driver and reporter make no effort to do that. Despite the fact that the driver says she sees this group every Sunday. Here’s a crazy thought: if you think someone is breaking the law, report them to the police. Next up is some driving alongside the cyclists and attempting to interview them while traveling the wrong way in the oncoming lane. At one point the reporter has driven ahead and stepped into the road into the group's path to attempt to… question them again. Rather than using these sensational and unsafe antics, why not follow the group until they come to the end of their ride and interview them properly, ONCE THEY ARE OFF OF THE ROAD. Nah, that might lead to a real dialogue. 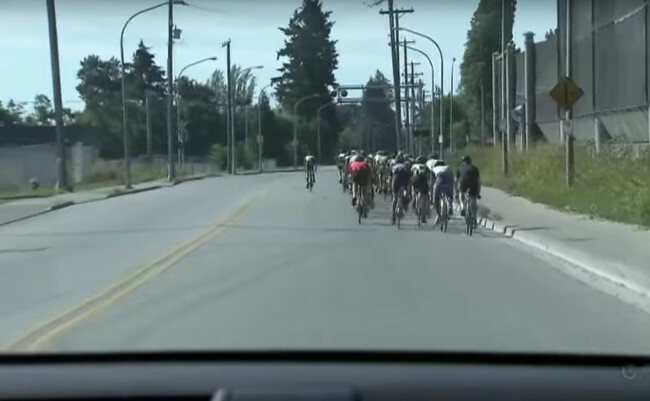 Next, they visit the executive director of Cycle BC to present their video evidence against the cyclists. And the director agrees that the behavior is improper and cites the age old “car back” shout out, followed by squeeze right and ride single file technique that cyclists have used for decades. And here is where we need to stop a moment and make an important distinction. Ok, so if you do understand why controlling the lane is crucial to rider safety, you’ve probably guessed where I’m going here. Taking the lane — when necessary — is not only safe practice for individual cyclists, but groups as well. Only with a group, the riders can take the lane by filling it up. Whereas, a single rider can only move toward the middle of the lane to stake his/her claim. But the same principles apply. Taking the lane often occurs because the lane is too narrow. And if you look at the video again, you’ll see that in most cases the road is narrow where the group takes over the lane. But later, something strange happens. Take a look at this screenshot. Huh? Why would these road-hog cyclists begin sharing the road? Because the conditions are such that controlling the lane is not necessary here. But people who don’t understand these concepts — including some cyclists — have no clue as to why the group’s riding technique has changed. Again, there are some bad actors out there, both on a bike seat and behind the wheel. But a group that is properly “taking or controlling the lane,” when necessary, is riding more safely. And this is no longer a well-kept secret among a few select cyclists. Federal and state DOTs are posting ‘Bike May Use Full Lane’ signs to educate drivers that this behavior is actually safe riding technique. And as crazy as it may seem to some of you, this method makes things safer for drivers as well. How? …when it comes to which group riding configuration works best on the road, consider this. Let's say your group has 15 cyclists and you all ride single-file, or break into single-file when a car approaches from behind. Since each bike takes up roughly 6' in length (nevermind the gaps between bikes for now), the group forms a line that is 90' long. Remember, each rider is allowed to take the lane, so they won't necessarily be hugging the far right edge of the road. And since drivers have to allow at least 3' clearance when they pass [in Ohio], chances are good that the driver will have to at least straddle the centerline to pass safely. The problem is that passing a 90' long group safely is not a simple proposition. Most drivers, however, carry on unfazed and thankful for the clear view that single-file cyclists allow, and start passing without due care or consideration. And when an approaching vehicle forces them off their centerline straddle, where do they go? Back into their lane and right into the group that's riding there. Does any of this sound familiar? It's the same "squeeze-by" principle that individual riders face on the road, only now it's on a much bigger scale. When experienced road cyclists are riding 2-abreast and in tight formation, they are reducing the length of their group by at least 50%. Shorter groups take less time to pass. And by taking up more width of the road, they encourage drivers to make safer decisions and not just drive onto the centerline without due care. A good analogy here is when you're driving in the country and have to pass a large farm tractor or combine on a narrow country road. The vehicle may be so large that you have trouble seeing around it well, so you become more cautious when passing. And when you find a safe opportunity, it doesn't take long to overtake the slower moving object. And finally, they are further clarifying passing laws to include the fact that drivers can pass slow-moving vehicles (tractors, bikes, etc.) in no-passing zones, as long as they have adequate sightlines and can do so safely. But I don't believe this specific language is on the books (yet) in Ohio. And there you have it. Got any friends, co-workers or riding buddies that think “car-back” and single file is always the best way to ride on the road? Send them a link to this page so they can learn why "taking the lane" is not just for the safety of solo riders.